Barbara Sanches joined the navy age 19. She knows her background is non-traditional in the MBA world. Originally from Brazil, Barbara started out in the military and eventually went on to work for Maersk as a deck officer. “Sometimes it’s hard to explain my background,” Barbara says. “Working at sea—it’s so far away from what people can imagine that it’s hard for them to understand. I was forced to grow up really fast!" Barbara was still working at sea when oil prices collapsed in 2015—and that’s when she decided it was time to leave the ocean behind and look for opportunities on dry land. Having already spent six months in Lyon, she was aware of EMLYON Business School’s local and national reputation for top-class business programs. But it was the unique specialization in entrepreneurship on the full-time International MBA that really peaked her interest. The MBA’s New Venture specialization offers dedicated courses on entrepreneurship, in which students will gain all the skills necessary to launch projects of their own. The startup incubator at EMLYON has supported 1,350 student projects so far, 85% of which are now over five years old—and it’s considered one of the best incubators in France. Barbara has always had an interest in creativity and innovation, and though you wouldn’t often link this with the pressurised maritime industry, outside of her job she was always busy developing her creative skills—aside from learning French, she’s also a self-taught fine art painter. It’s the innovative learning methods on the International MBA at EMLYON that have stood out for Barbara, as well as the opportunity to collaborate with people from all over the world on the program. With her “very specific, quite unique” background, as Barbara says, she was worried about fitting in. She’s experienced this before—in the Navy, she says, she was often the only woman in some of her teams. The MBA at EMLYON has a reputation for being diverse—though the cohort is smaller than other business schools, they routinely have over 20 nationalities represented on the program. Barbara says EMLYON’s international outlook has been the greatest advantage of the program so far. “Even though my job in the Navy was somewhat international, I never thought I’d be able to collaborate with someone from Nigeria or Lebanon,” she adds. What does Barbara have planned for after her MBA? 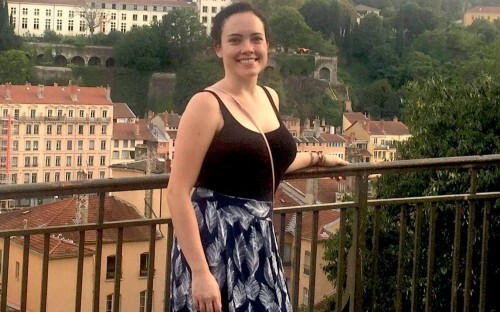 Ultimately, Barbara says she’s glad she left the sea life for the EMLYON MBA—but she’s also grateful for her former work.